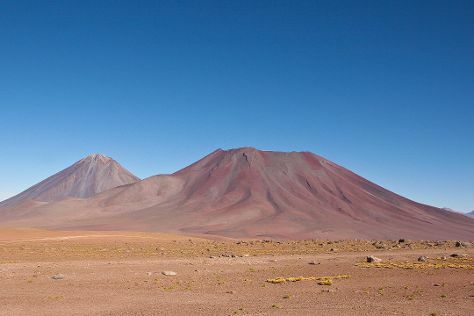 San Pedro de Atacama is known for nature, wildlife, historic sites, nightlife, and museums. Your plan includes some of its best attractions: take in the dramatic natural features at Valle De La Luna, soar above the sights with a balloon tour, explore the fascinating landscape at Atacama Desert, and examine the collection at Father Le Paige Museum. To plan San Pedro de Atacama vacation without wasting time, ask Inspirock to design an itinerary. Sao Paulo, Brazil to San Pedro de Atacama is an approximately 12.5-hour combination of bus, flight, and shuttle. You can also do a combination of bus and flight; or drive. Traveling from Sao Paulo to San Pedro de Atacama, you'll gain 1 hour due to the time zone difference. Traveling from Sao Paulo in June, expect much colder with lows of 0°C in San Pedro de Atacama. Finish up your sightseeing early on the 1st (Mon) so you can travel to Vina del Mar. A more organized counterpart to its chaotic neighbor Valparaiso, Vina del Mar lives up to its reputation as the "Garden City." Brimming with public parks and flower displays, Chile's fourth-largest city embraces nature, with palm-lined avenues enhancing the "green" ambience. Kick off your visit on the 2nd (Tue): get the lay of the land with Walking tours, examine the collection at La Sebastiana, then don't miss a visit to Flower Clock (Reloj de Flores), and finally examine the collection at Corporacion Museo de Arqueologia e Historia Francisco Fonck. On the 3rd (Wed), you'll have a packed day of sightseeing: learn about winemaking at Emiliana Organic Vineyards, then kick back and relax at Reñaca, and then admire the landmark architecture of Palacio Rioja. Plan my Vina del Mar trip by asking Inpirock to come up with tips and suggestions. You can do a combination of shuttle and flight from San Pedro de Atacama to Vina del Mar in 6.5 hours. Alternatively, you can drive; or take a bus. Traveling from San Pedro de Atacama in July, expect nights in Vina del Mar to be somewhat warmer, around 9°C, while days are little chillier, around 17°C. Wrap up your sightseeing on the 3rd (Wed) to allow time to drive to Santiago. Santiago is known for museums, shopping, parks, nature, and historic sites. Your plan includes some of its best attractions: don't miss a visit to Santa Lucia Hill, browse the eclectic array of goods at Central Market (Mercado Central), examine the collection at La Chascona, and enjoy breathtaking views from Sky Costanera. Take the guesswork out of planning a Santiago vacation by using our trip itinerary maker. You can drive from Vina del Mar to Santiago in 1.5 hours. Alternatively, you can take a bus. Finish your sightseeing early on the 7th (Sun) to allow enough time to travel back home.